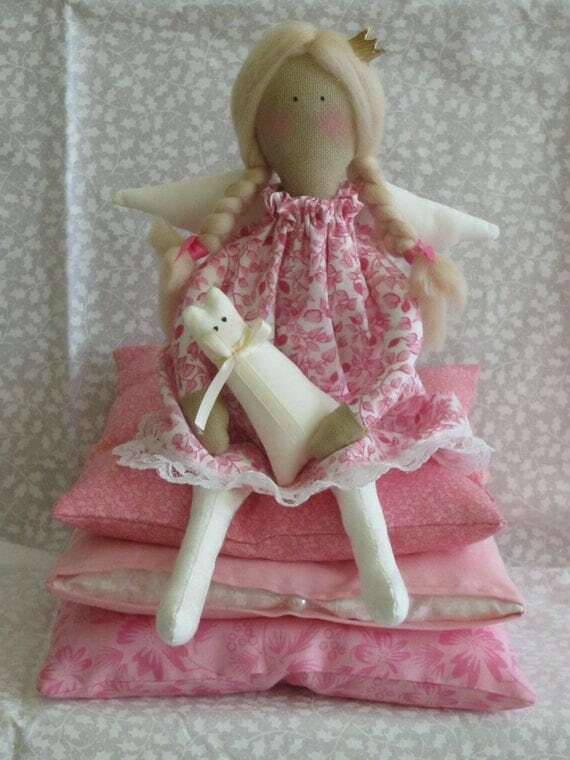 As my before article of the Princess and the Pea doll was the most viewed on my blog. I thought the best would be to share this project with you as this year's early christmas present from me to you. Hope you will enjoy making this real Sweety Pie!!! I cannot wait to see the the results. Doll hair, or fluffy yarn. Take your colored fabrics and cut two (one from a lighter colored fabric) 18cm*18cm square, one 19cm*19cm square, 20cm*20cm square. Sew the 18cm*18cm squares up with the right side facing each other leaving a small opening for turning out and stuffing. Turn them inside out stuff and sew the opening up. Hem one side of the 19cm*19cm square sew up the sides as above. Stuff, with one of the 18 cm pillow and attach the pearl onto the side. Sew the 20cm*20cm square up with the right side facing each other leaving a small opening for turning out and stuffing. Turn inside out stuff and sew the opening up. Place pillows on top of each other and fasten them together in the very middle. If you want to sew cases for the pillows tale off 0,5 cm of the original pilowsizes. 6so the 18cm*18cm square case will hold a 17,5*17.5 cm pillow. Trace body onto skin colored fabric. Trace legs and wings onto white fabric. For the hands you will need a 2* 12cm*12cm color fabric and a 2*4cm*12cm skin colored fabric. Sew the two pieces (one skin and one colored) together put the two fabrics on top right side facing. Press or Iron down the seam allowance. Trace hands onto the fabric sewn together with the top of the hand on the skin colored fabric. Make sure that the fabrics are exactly on top of each other and are the same size. Sew all parts with opening turn and stuff. Legs to be sewn into the body by inserting them into the lower still open body part. It is better to fasten them with pins and sew by hand and only after that sew by the machine. The hands have to be sewn from the outside. For this finish the hands by stuffing and sewing in the opening, than pin it onto the body and sew it on with hand. Cut a 14cm *14cm *2 square of a colored fabric. Sew on one side together leaving 2 cm free on top and iron seam allowance. Hem the bottom. Hem the top with 1cm allowance so you can drive a smaller pin through it. Secure the ribbon with the pin and pull it through the hem hole .Sew up the side of the dress don’t forget to leave a hole for the arms on both sides. Dress your doll. Pull the ribbon on the top of the dress cut off extra ribbon. Cut off same size pieces of hair or yarn. 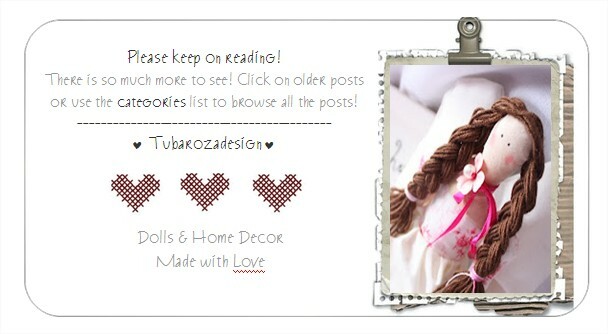 Add the hair to the doll by pinning it onto the head in the way you like it. Sew on the head and remove pins. You can plait the hair if you want to. Add the crown with a hot glue. Trace wings onto white fabric sew it up according to the pattern. Leave a small opening in the middle of (the bottom of the) fabric and turn and stuff. Attach to the back of the princess. Add eyes and a bit of redness to the cheeks. 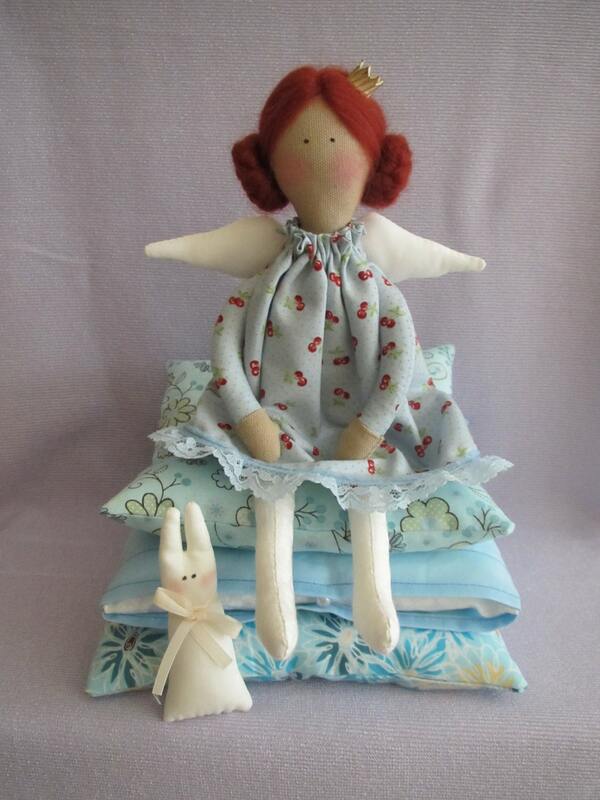 Place doll on pillow you can sew it on as well if you prefer.